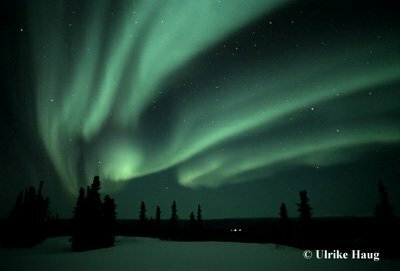 Summary: Solar wind streams flowing from coronal holes hit Earth's magnetic field on March 3rd, 5th, 14-20th and 26-27th. 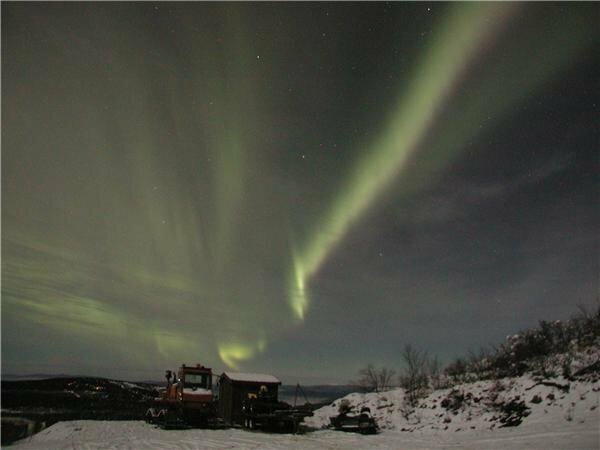 In each case, the impacts triggered G1- to G2-class geomagnetic storms. 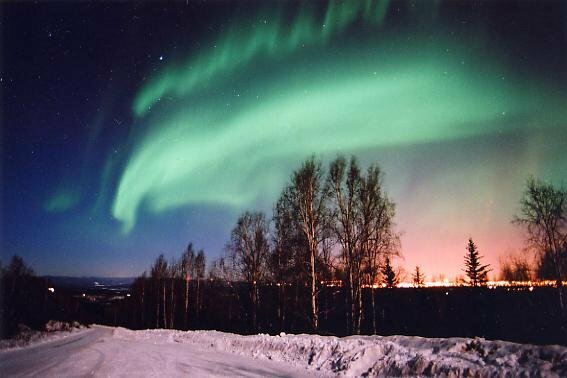 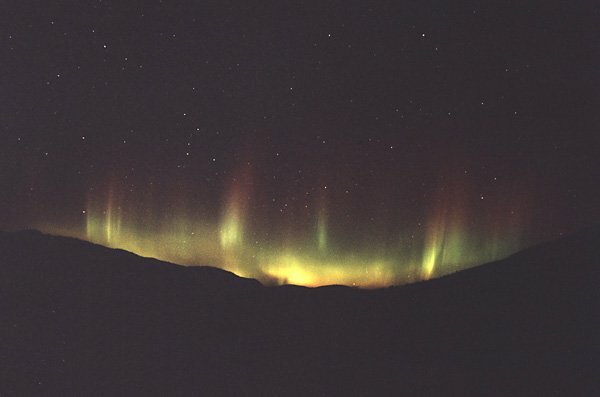 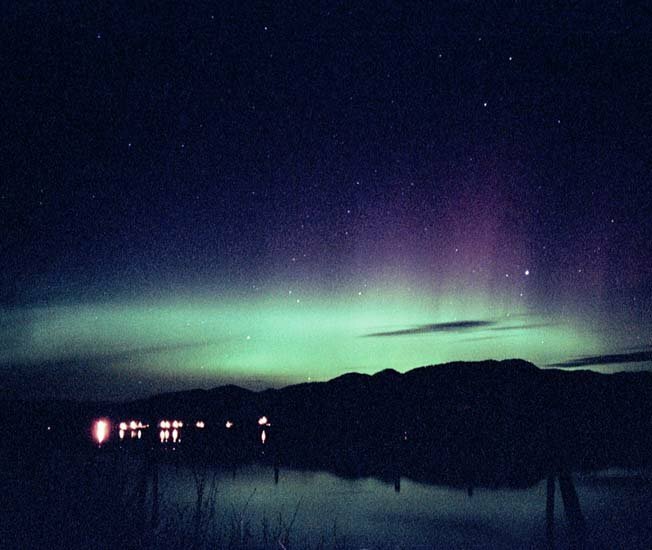 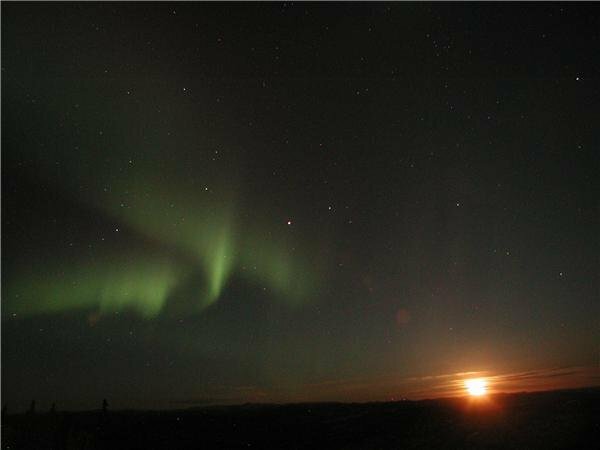 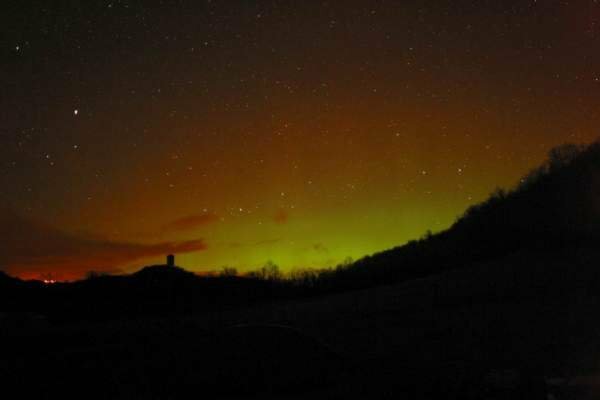 See also the February 2003 aurora gallery. 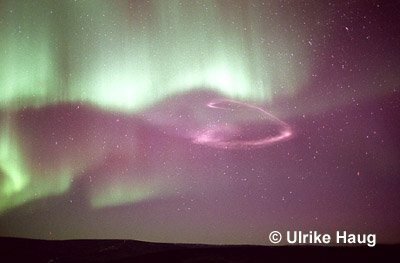 Unless otherwise stated, all images are copyrighted by the photographers. 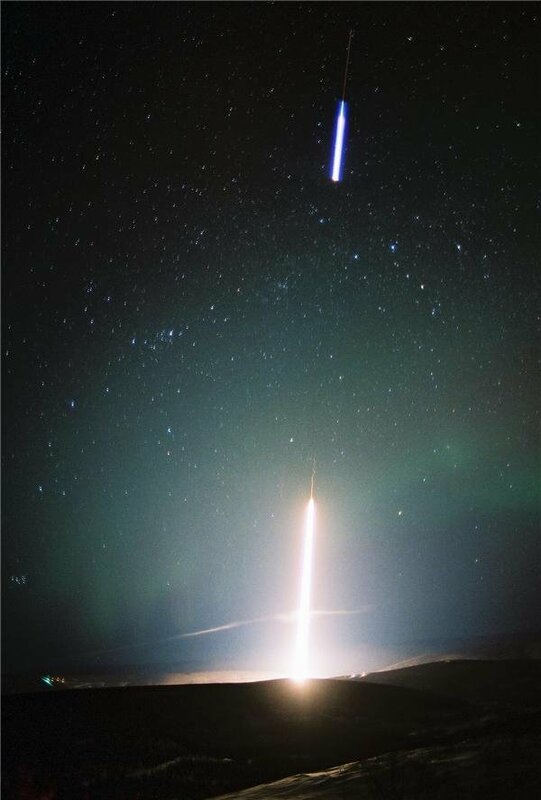 March 27 #1, #2, #3, more U. Haug: "These images show the results of some rocket launches on March27th from the Poker Flat Research Range, near Fairbanks, Alaska. 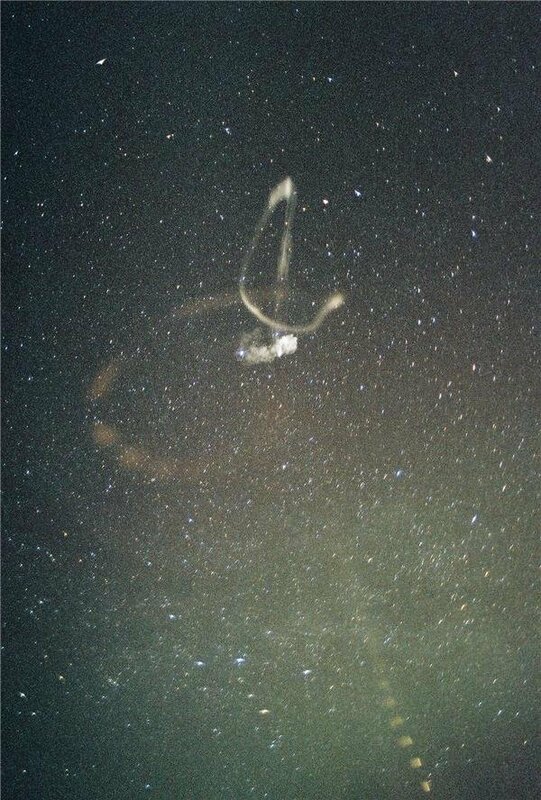 Four rockets were launched that morning, loaded with trimethyl aluminium and instruments. 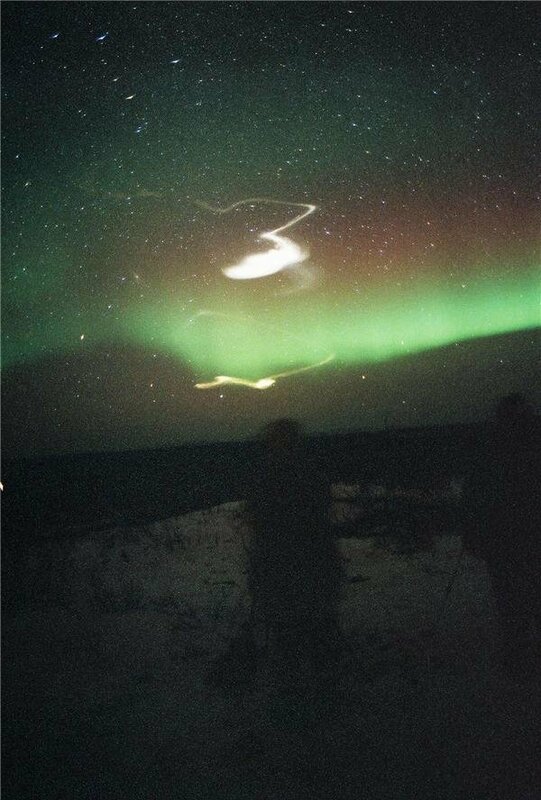 Two of the rockets released their chemicals and produced man-made auroras as seen in my images." 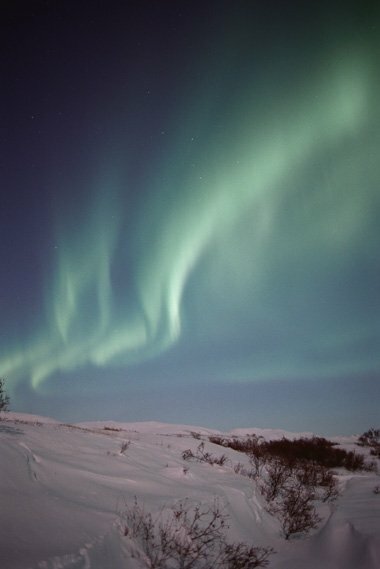 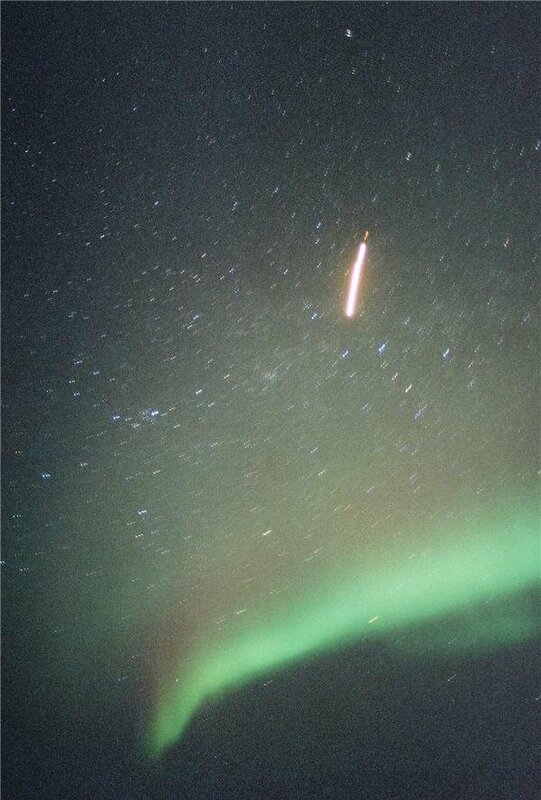 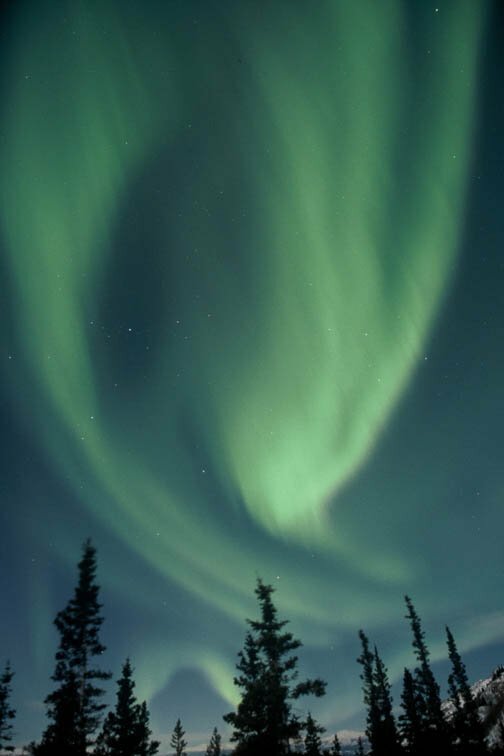 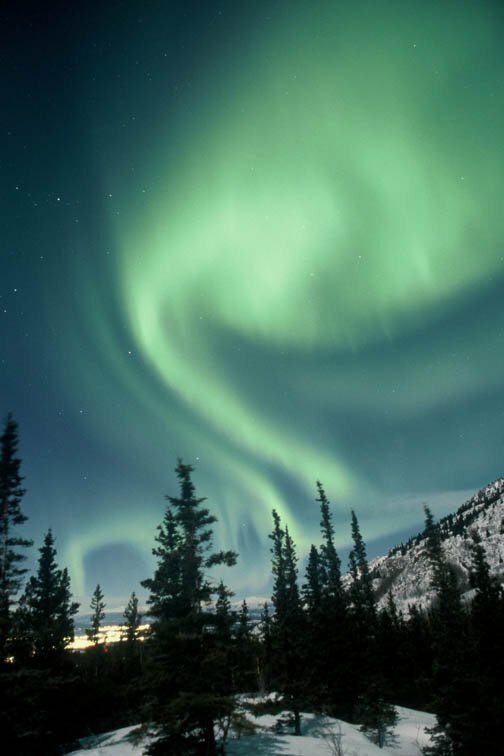 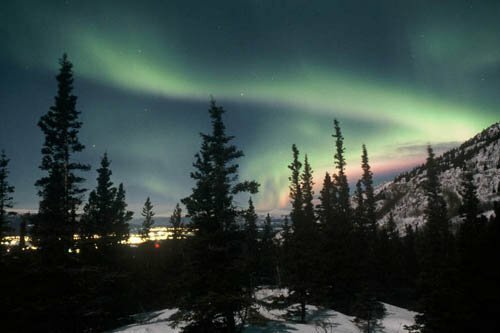 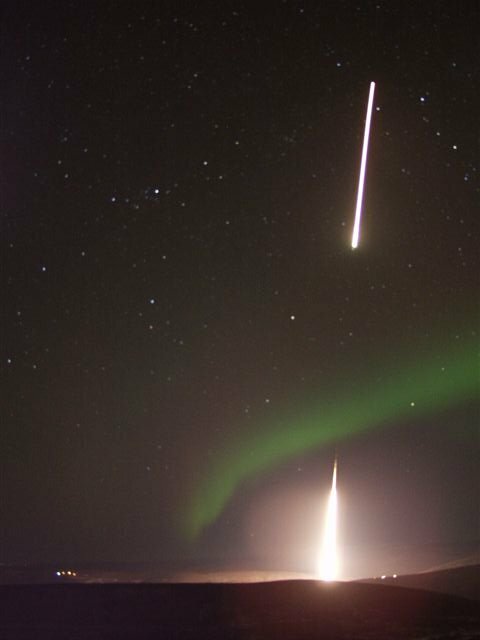 March 25 #1, #2, #3, #4, #5, #6, #7, #8 On March 25th, scientists at the Poker Flat Research Range near Fairbanks, Alaska, launched a pair of rockets directly into some bright Northern Lights. 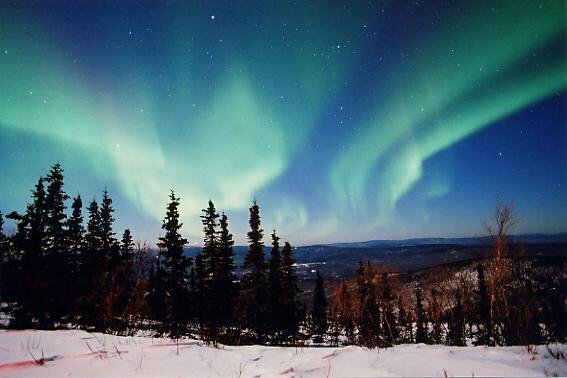 Their purpose: to lay down a trail of easily-seen chemicals and thus reveal the motions of air inside the aurora borealis. 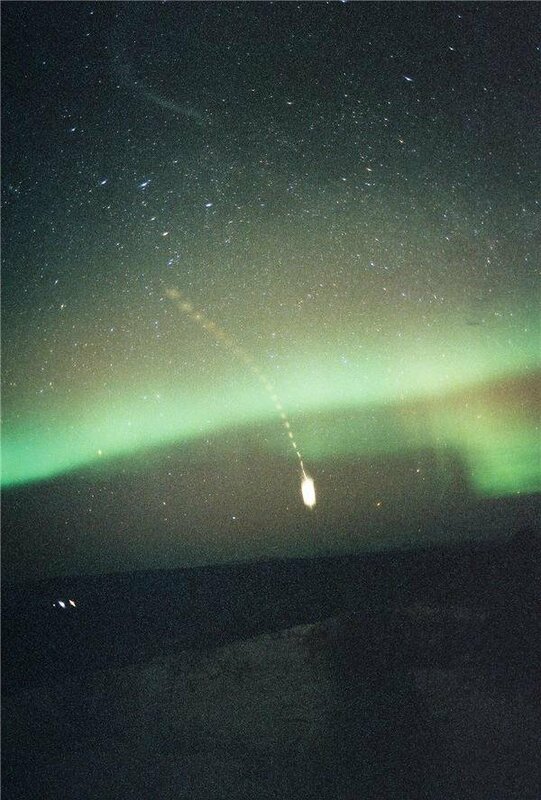 Chuck Johnson photographed the launch. 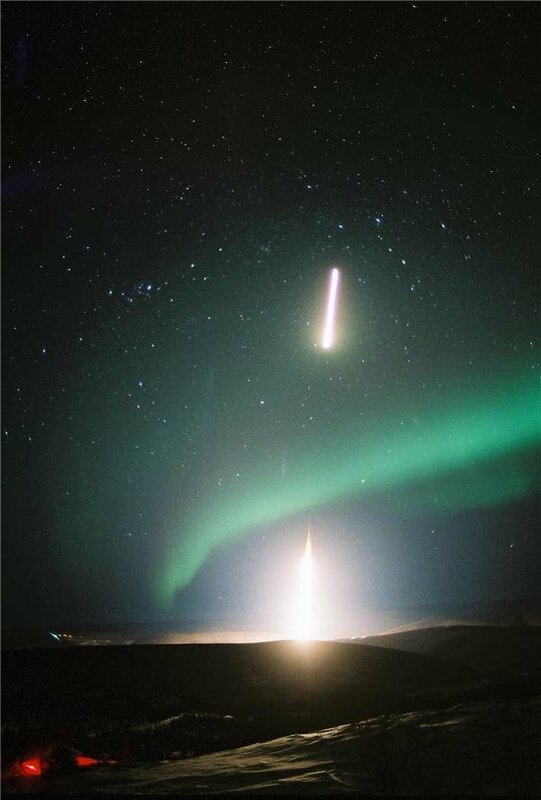 "After reaching altitude, the rockets appeared to flatten out and fly to the north where they released glowing chemicals," says Johnson. 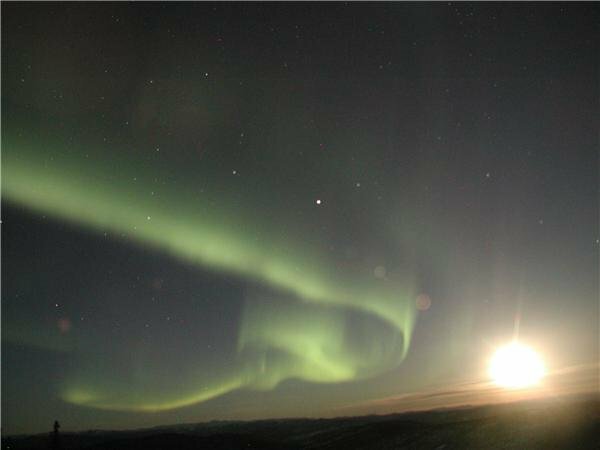 "The 'man-made auroras' lingered in the sky for a long time." 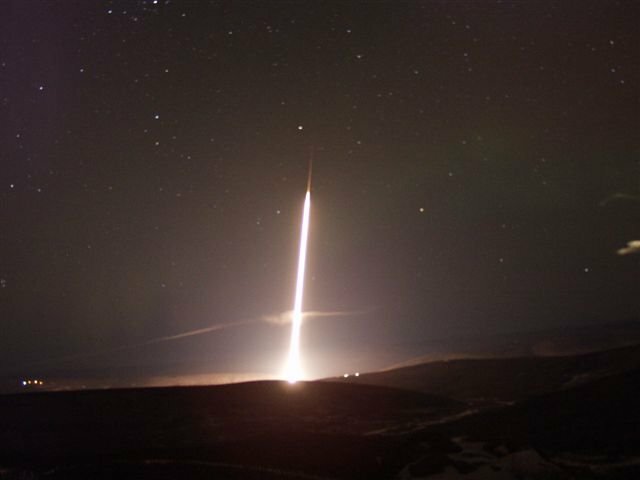 March 25 #1, #2, more Troy photographed the same dramatic rocket launch at Poker Flat Research Range that Chuck Johnson saw. 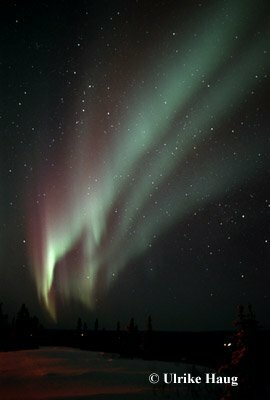 Stay tuned for a web movie from Troy! 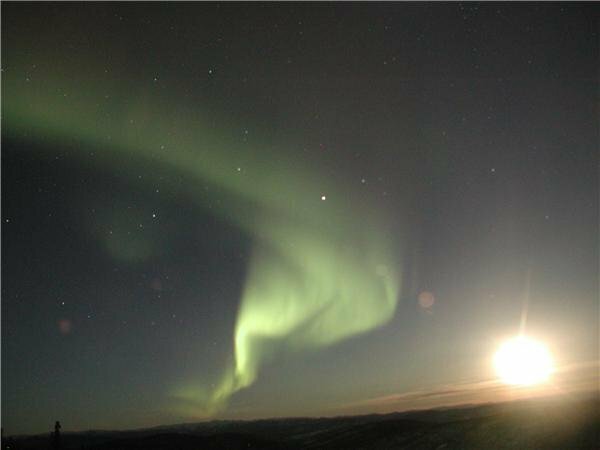 March 13-15 #1, #2, #3, #4, #5 D. Vier: "the moon was so bright that it was easy to see one's surroundings, yet the aurora was easily visible most of the night from local midnight to dawn, with a number of bright substorms. 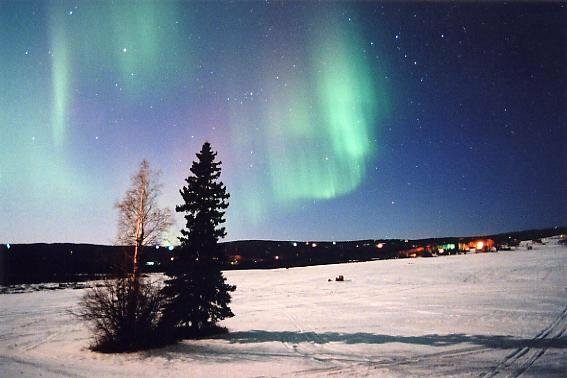 Each night the temperature was around -15 degrees Fahrenheit with windchills below -30 degrees. 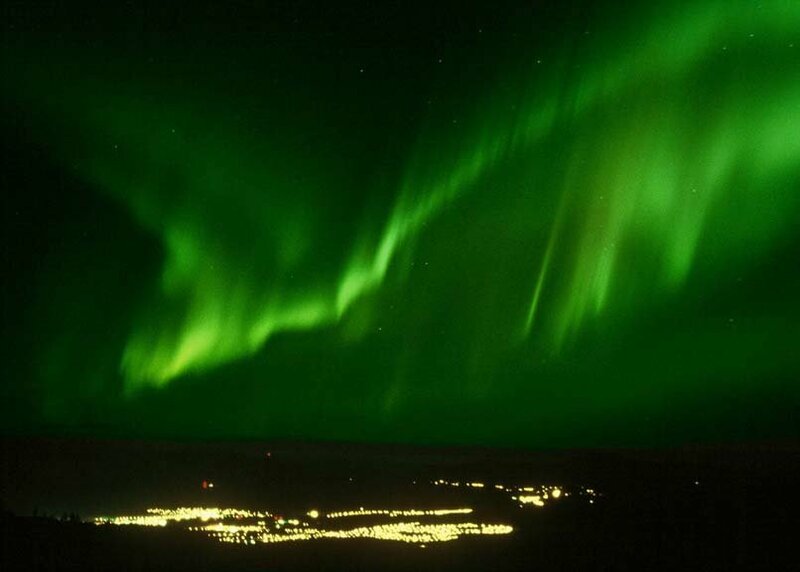 The night of Mar 13 the Anchorage airport was actually closed due to winds of up to 70 mph!" 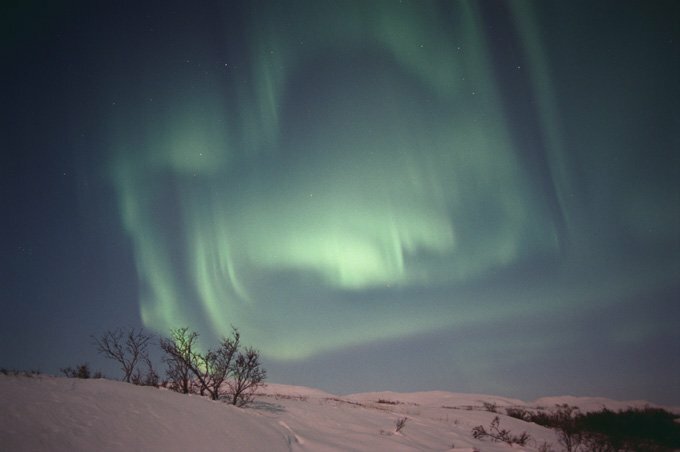 Details: Minolta Maxxum 7000, Tokina 20-35 mm lens @f2.8 for 15 seconds. 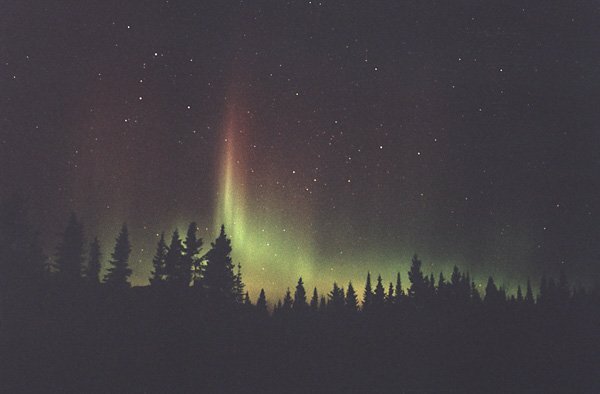 800 and 400 ASA film. 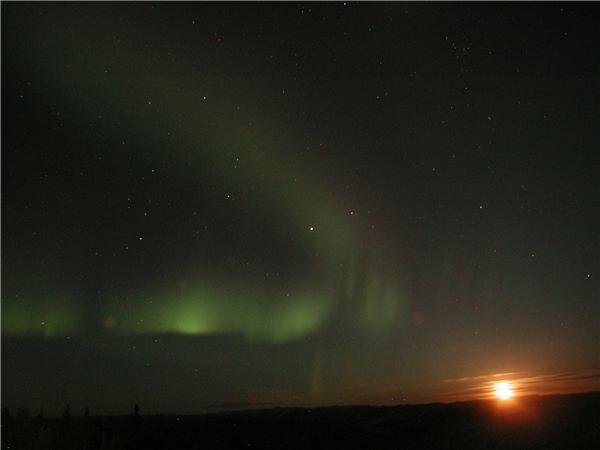 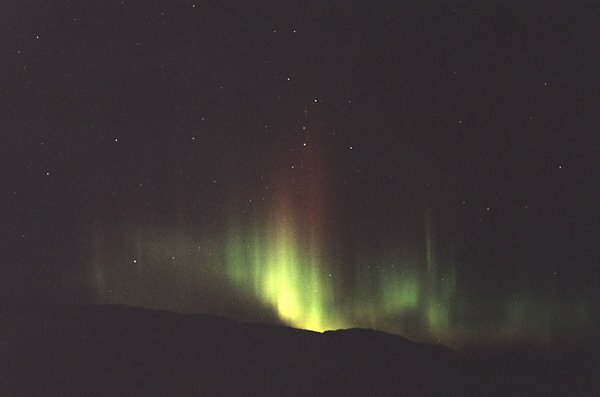 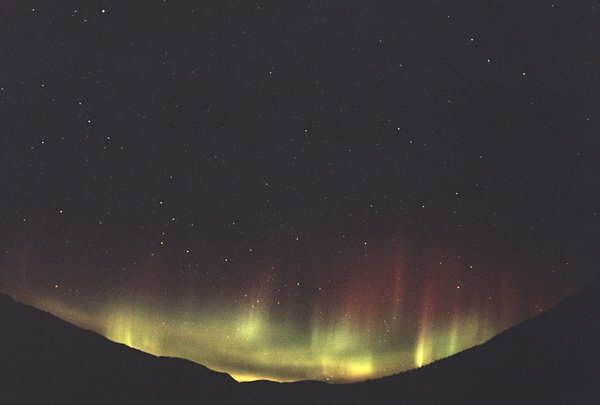 March 16 #1, #2, #3, #4 J-M Sauve: "These beautiful strong auroras lasted 2 hrs. 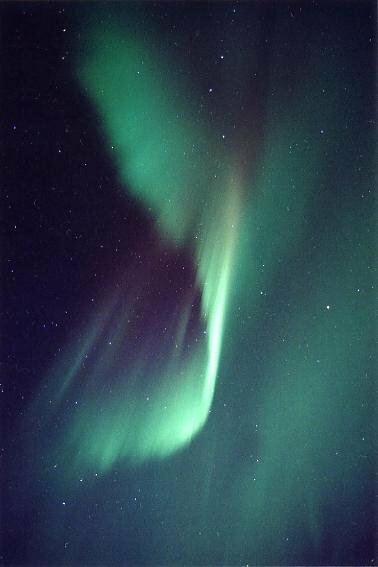 Details: 24mm @ 2.8, Provia 400F"
March 20 #1, #2, #3, more J. Kinnunen: "Last night brought us the finest aurora display of this year. 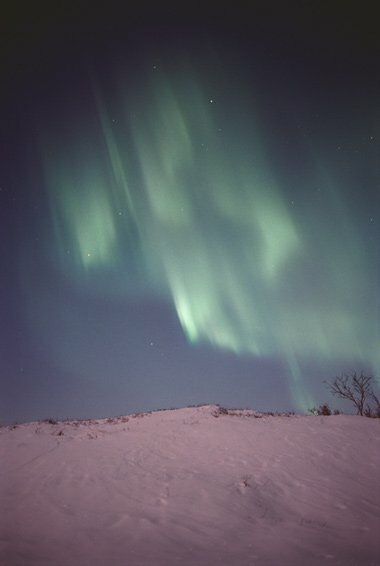 The sky was perfectly clear, the temperature was around -10 C. Details: Nikon F100, Nikkor 28/1.4, Fuji Provia 400F." 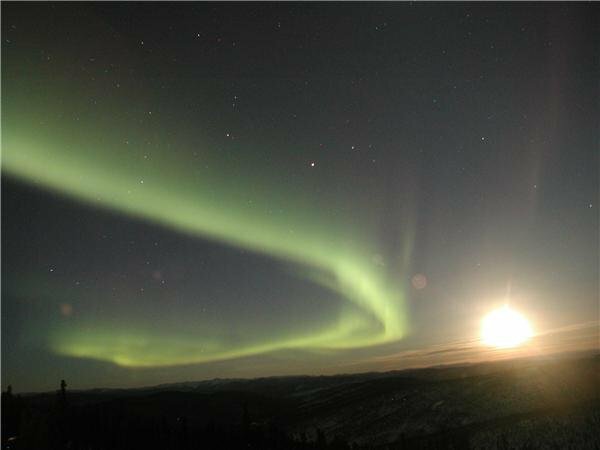 March 18 #1, #2, #3, more J. Russell: "I actually saw the already moonlit landscape brighten a bit as this intense blast came! 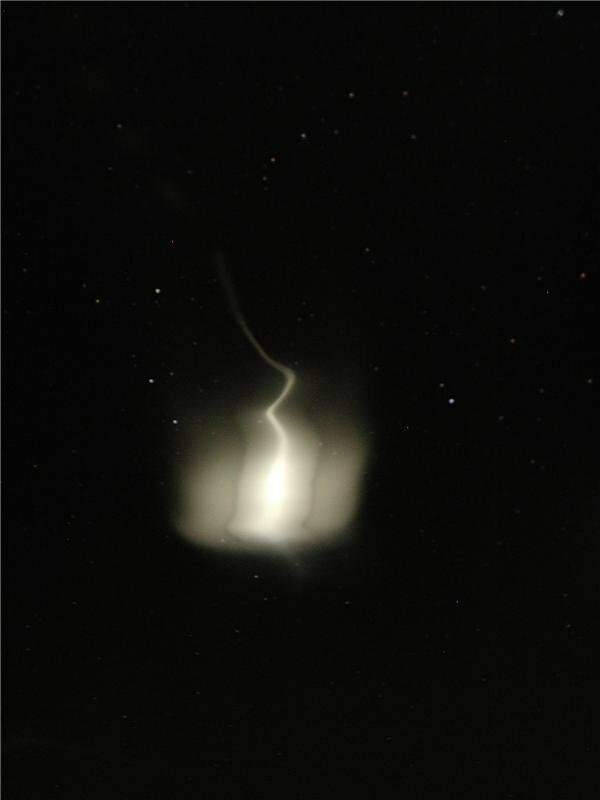 This substorm lasted less than a minute." 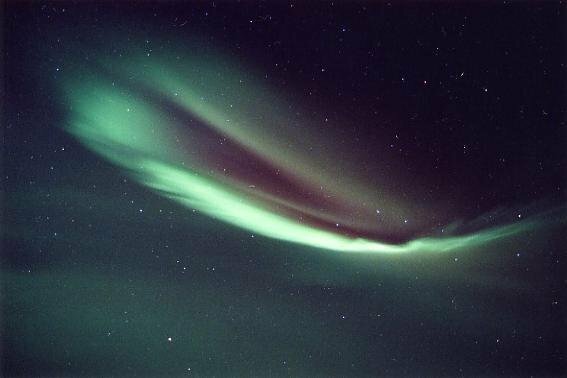 Photo details: Nikkor 28mm, f1.4, Fuji Superia 400, 3 seconds. 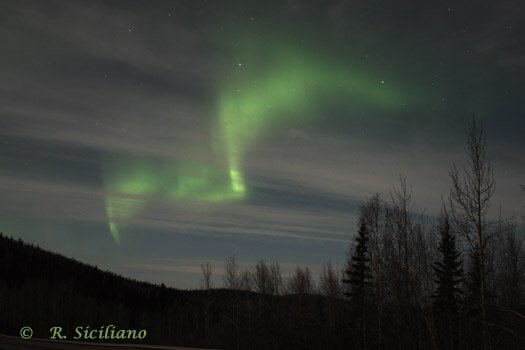 March 16 #1, #2, more R. Siciliano: "I took these two photos on my drive to Anchorage, AK last night. 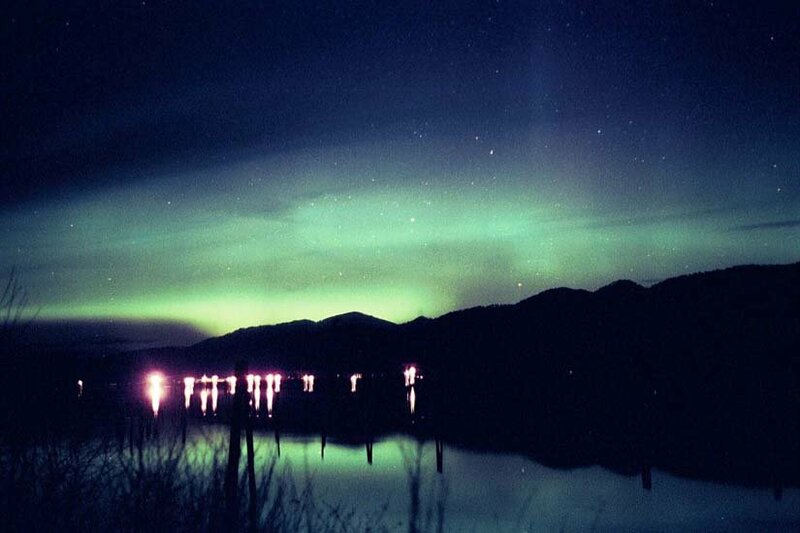 The first one was taken near Clear, AK at approximately 2:30 AM. 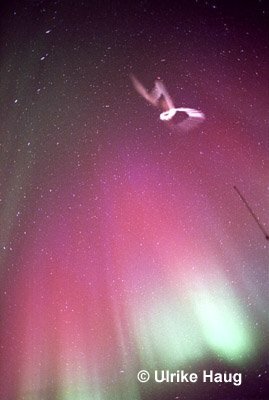 I like the way the aurora snakes its way in and out of the clouds to form what appears to be an outline of a bird in flight. 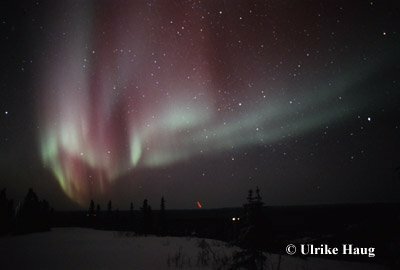 The second one was taken outside Healy, AK about 2 hours later. 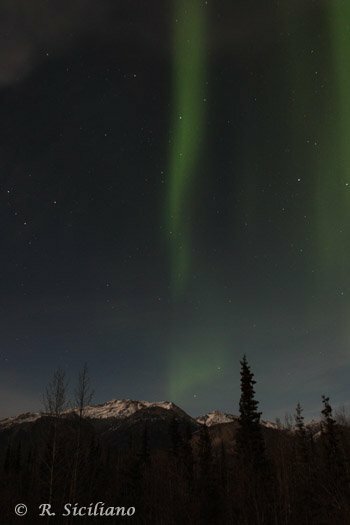 These two locations were the only clear sky spots for my 350 mile drive." 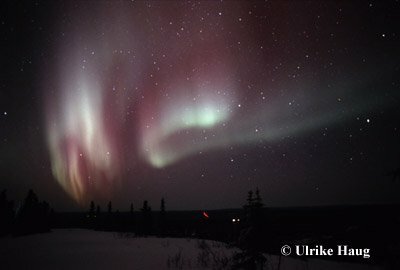 March 5 #1, #2, #3, #4, #5, more U. Haug: "March 5th brought an interesting night of aurora activity. 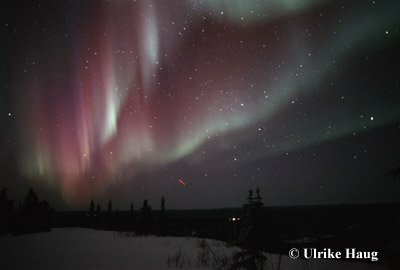 The first part of the substorm showed visible red in the curtains. 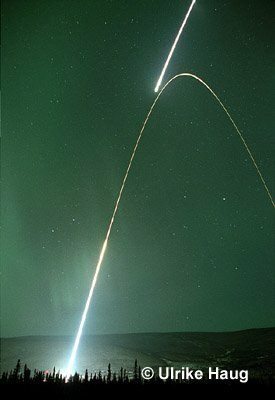 In three of the images you can see a red light trailing upwards as Poker Flat launched a weather balloon to check on the winds."